Justin Sims here! I hope everyone is having a wonderful summer and not working too hard. We have been working away at the shop, but my dad, Jerry, and I were lucky enough to get away and go on an amazing trip to Europe last week and I thought I would share some of our experiences with you and what led up to this trip. I hope you enjoy the read! As most of you probably know by now, my dad had a heart attack a couple of days before New Year's Eve while he and I were setting up for a gig. Luckily, we were able to rush to the hospital very quickly, where the doctors were able to save his life. This was the scariest and most stressful experience of my life, and our families and I know that many of you were affected as well. On that note, thank you to everyone who was thinking about and praying for us, as we felt every single thought and prayer. About 2 hours outside of Paris, France, is a small, beautiful town (commune) named Samois-sur-seine. This was one of the most amazingly peaceful and beautiful places that we had ever seen. We were dropped off in the middle of nowhere, France, on a mission to find the grave of a guitar player. Most people would think we are crazy (and we would probably agree), but that didn't stop us. We wandered the small town, trying to break down the one map we had found, walked through some quiet woods behind houses, and eventually came to a cemetery. We started walking up and down the aisles trying to locate the gravesite of Django Reinhardt, and after about 20 minutes of searching...we found it! This was something beyond cool for my dad to get to do. We admired the memorial that was built for him, took some pictures, and Dad even left a gypsy guitar pick by his grave. Getting to be as close as we ever can be to one of, if not the, greatest guitar player of all time was a very special and moving experience. After taking some time there we headed back to the peaceful town for lunch and then searched and searched again until we were able to find Django's home that he lived in when he passed away. Dad was mesmerized by the idea of Django sitting in that house over 60 years ago, just practicing away. This was truly an inspiring day for Dad, so get ready for him to push his gypsy music even more now than ever! A few days later, we got to make our way to London to begin the Beatles experience! It had been a long and tiring trip, but knowing what we were going to get to see when we got there kept us excited (and anxious!). We spent a little time walking around (crazy, busy) London but then hopped on a train towards the famous Abbey Road! If you were walking by late at night, there's a chance you'd miss it, as there aren't any historical markings or statues around. But as we got closer to where the map was leading us, we heard all kinds of people laughing and yelling, so we knew we were at the right place. And sure enough, there it was! ABBEY ROAD!!! The picture you've looked at your entire life...was right in front of us. We managed to get a great picture crossing the famous crosswalk, but we'd be lying if we told you it only took one trip with no stress. This road is very active all day long with cars and buses flying by (some of the drivers were not happy with you being in their way). So, we had to run out and pose, then run back, check the camera, go back, and do it again several times. What started as a stressful situation ended with laughter because you are joined by 100s of other people running around the street on a busy day in London for a picture. Dad and I had an absolute blast with this experience! I even went barefoot like Paul McCartney (but I promise...I'm still alive)! The next day we made the 2 hour train ride to where it all began...Liverpool! As soon as we stepped off the train, we knew that we were somewhere special. Liverpool had a special feel and charm to it that the big city of London seemed to lack, in our opinions. Not to mention, we were overwhelmed with the idea that we were standing in the city where the Beatles were formed. With the help of The National Trust, we got to experience something like nothing else (at least for Beatles nuts like us)...we got to go inside the childhood homes of Paul McCartney and John Lennon! This was an experience we will never forget. You have to go through the Trust to go inside the house, so if you ever make the trip, be sure to contact them and plan months in advance! 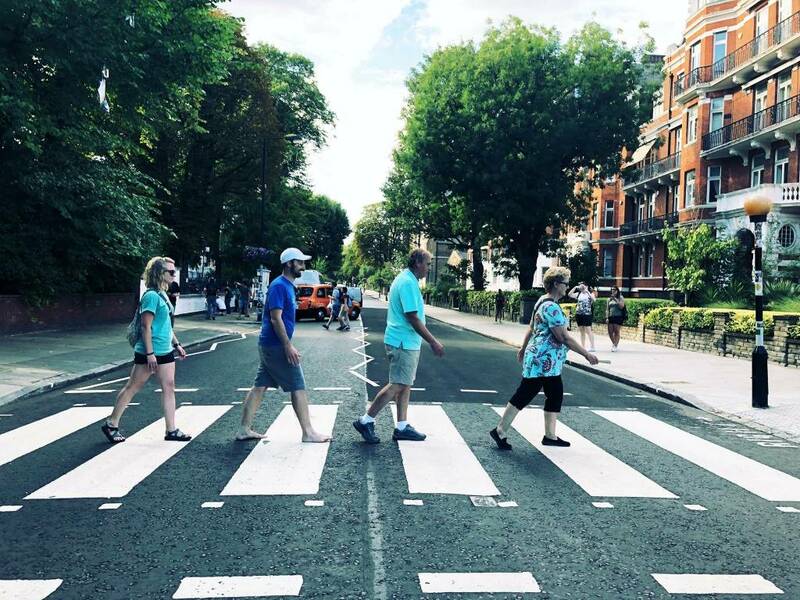 Upon arrival at Paul's home, you are greeted by your tour guide, who is a guaranteed to be a genuine, Beatles fanatic with such respect for the legacy and a wealth of knowledge of all things Beatles. There were no photos allowed inside the house, but we were able to get some outside shots. While inside, we sat in the living room as our guide told us all about Paul's childhood and family life and which songs were written in that actual room, and we got to take a look at photos that were taken by Paul's brother, Mike McCartney. It felt as if the McCartney family was still in the house with us. Just being in this small, government assisted home, knowing that the greatest of Paul McCartney was grown and fueled within these walls, was something heavy to experience. We walked through their bedrooms and even through the garden—all places that were mentioned in or influenced famous tunes. One of these famous songs was "When I'm 64," a song that Paul wrote for his dad on his 64th birthday. This was almost a tear-jerker for our family, as Dad recently turned 64, a week after his heart attack. Another amazing part of this visit was that we were able to play the piano in the living room. This piano has been played by Paul McCartney, Jon Bon Jovi, Bob Dylan, and others. We got a very special treat when my girlfriend, Jessica Skinner, sat at the piano and began playing "Let it Be." She later told us that of all the times she has performed, that was the most nervous she had ever been. Let that give you a little hint of the magic you feel in this house. If any of you got to see Paul visit his home on the James Corden show on CBS, this was the same house (and the same tour guide!). It was very cool to go back and watch that again and see Paul standing right where we had been just 6 weeks later. After spending time at the McCartney's home, we got in the van and rode 5 minutes up the road to the childhood home of John Lennon. Once again, we were greeted by an amazing tour guide who knew more information about Lennon and the Beatles than time would allow him to tell us. He walked us through the gate and into the back door of the kitchen, just as John's aunt Mimi (who raised him) would have made him and his friends, as they weren't welcome to enter the front door, which was reserved for doctors, lawyers, and clergy. Our guide talked us through in detail all of the struggles of John's early childhood life, including the loss of his mother as she was hit by a car while walking home one evening. Hearing these stories really let you understand why John was who he was and what was behind all of his amazing songs. After visiting the rooms downstairs, we headed upstairs to John's bedroom. It was hard to believe that this 8x6 box of a bedroom that I was standing in, as I looked out the window, was the same room in which John Lennon grew up. Just imagining (no pun intended) him sitting there, looking out the window, and finding motivation for his songs and his life, was wild. After this, we walked downstairs again and went into the small 6x4 glass entrance-way of the house below John's bedroom, where he and young Paul McCartney used to go to play and sing when the family kicked them out of the living room for making too much noise. Apparently, they loved this, though, as they called this entrance area to their house "their own echo chamber" where they could sing away and work on their harmonies. After finishing up, we grabbed a few more photos outside and then drove away. Of course, as we cruised down the road, by Penny Lane, our driver had Beatles' tunes playing away. Hearing those songs while driving through the city where they were created...this is something else that I will never forget. I'm sure every one of you has a dream of experiencing something or visiting somewhere that is very special to you. I'm young and still learning how to live life, but if I can offer one piece of advice after this trip...make sure you get to that place, and make sure it's with the people that are most important to you. My dad has been wanting to make this trip for his entire life, and had it not been by the grace of God, he wouldn't have gotten to. I grew up watching my dad listen to music nonstop, study the guitar everyday, and work all day everyday at his music store so that he could support our family—and this passion was all started because of The Beatles! If you are are musician, and I assume most of you are...The Beatles, some other legendary artists, or a loved one have inspired you and are the reason you do what you do. Study who inspired you, share your inspiration with others and younger generations, and soak up everything about that artist and their music that you can. If we all chase after something like my dad chased after The Beatles' and their music, I promise we will all live happier lives in a more peaceful world. I hope you all have enjoyed reading about our experience. And once again, thanks for your continued support. You will never know how much it means to our family, as you allow my dad and me to live out our dreams everyday of our lives. We are beyond blessed to do what we do, and even more blessed that it happens to be with the staff and customers that we get to include as part of our family. Many thanks and I'll see ya soon!